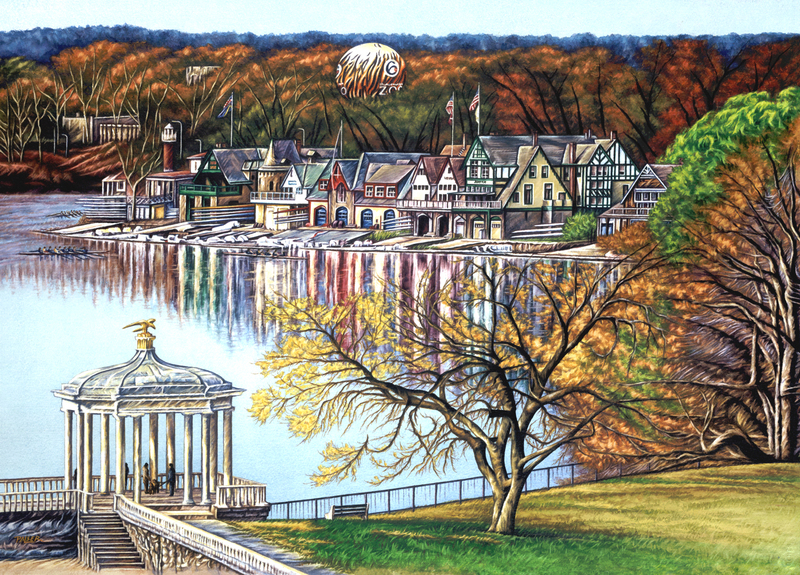 “Boathouse Row in Autumn” is now available for purchase. Boathouse Row is one of the most recognizable scenes of Philadelphia. The Turtle Rock Light House, The Philadelphia Zoo Balloon and The Waterworks Pavilion can be seen in this view. Historic Boathouse Row on the Schuylkill River is home of the Schuylkill Navy of Philadelphia. Founded in 1858, the Schuylkill Navy is the oldest amateur athletic governing body in the U.S. and host several major rowing regattas on the river. The clubs that comprise the Schuylkill Navy are Philadelphia Girls Rowing, Undine Barge, Penn Athletic (Penn-Ac),Club, Vesper Boat Club, Malta Boat Club, University Barge Boat Club (Penn), Bachelors Barge, Crescent Boat Club, PA. Barge Club and Fairmount Rowing Association. The first club started was Bachelors Barge in 1853 and in 2004 Gillin Boat Club is the latest addition. Whatever your activity may be, rowing, jogging, bicycling or sight seeing, Boathouse Row will provide you a beautiful setting with ever lasting memories. To purchase a Limited Edition Giclee Print go to www.bethpalser.com. Sorry, The Original Watercolor is sold, but Limited Edition Giclees are available.